Enjoy a morning of painting, drawing, and Creating in the garden at Michener House. All art supplies are provided. This drop-in program is offered every Saturday from June to August. Guided Bus Tour of Lacombe’s Historic Downtown. Pick-up at the Lacombe Memorial Centre. FREE ADMISSION TO ALL EVENTS! Guided walking tour of Lacombe's Historic Downtown. Tours start at the Michener House at 10am, 2pm and 3pm. Enjoy the company of some of Lacombe’s most famous characters from the past played by local heritage performers from the Zap Theater company. Have a piece of cake, get your picture taken by Ben Cameron, or make a Canada themed craft. Hop on a horse drawn wagon for an exciting ride through downtown Lacombe. Watch the Blacksmiths at work and learn about the tools of the trade at the Blacksmith Shop. Annual Chalk Mural Competition and family friendly activities at the Michener House Museum. Learn Métis Finger weaving. Pet a friendly creature at the petting zoo. Watch the Blacksmiths at work and learn about Canadian Tools at the Blacksmith Shop. Guided walking tours of Lacombe's Historic Downtown. RAINBOW KNITTING BEE at the Michener House Museum. From carding to knitting, learn it all at the Michener House Museum. Join our rainbow knitting bee. Watch the blacksmiths tackle a group project at the Blacksmith Shop. Special Events at the Museums throughout the festival. Watch the Blacksmiths at work and learn about the tools and the trade at the Blacksmith Shop. Join the Lacombe & District Historical Society as they revisit Christmas of yesteryear. 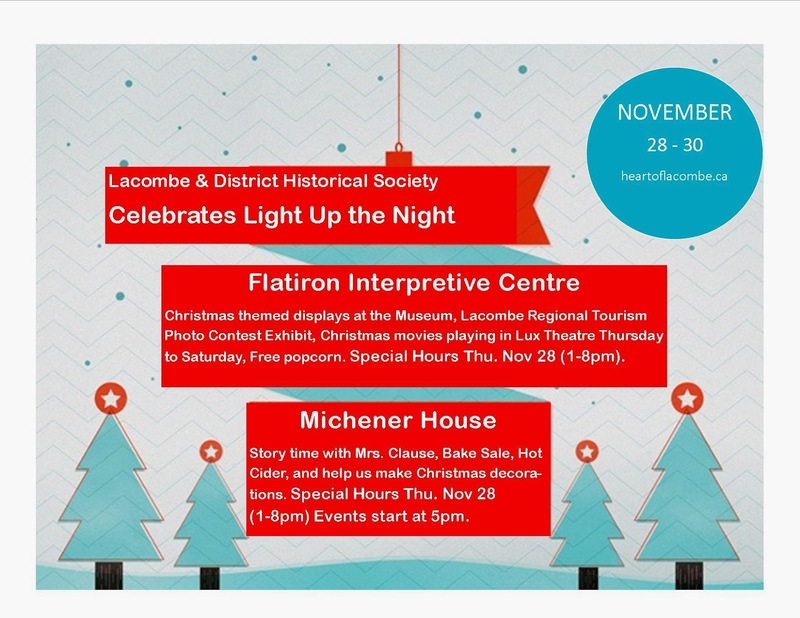 Stop in to cozy Michener House and listen to festive stories. Get a taste of old fashioned Christmas with free cookies and cider. Purchase Christmas cards and handmade decorations. See what museums in the area have coming up. Central Alberta has 47 different Museums for you to visit! Suggestions or comments about the blog or the museum? maski@telusplanet.net, call us, or come in for a visit.